Dear friends following your requests, Franznap will be happy to provide for you conversion works and sculpting on demand, soon you can find here some proposals with average costs. to discuss the details of the services. We can realize uniform plates ad hoc on request as in the picture. realization of conversions with cutting and shaping the existing figures, and adding new details or parts with green stuff or other necessary materials. The original existing figures must be provided by the client. The realization of figures not suitable for production, with green stuff and other materials on wireframe. Upon request we can realize and produce special event figures, the client will receive the figure directly produced and packaged with special dedicated label.The figure can be produced in metal or in resin. We realize masters for producers upon request. 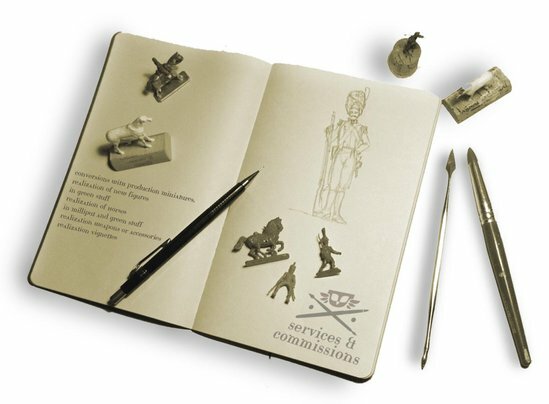 Franznap miniatures will provide sketches to the client before starting the sculpting work for reach the right understanding of the client wishes. and you can pay with normal credit card. You can add 1€ in the basket till you will reach the service amount previously agreed with Franznap Miniatures after that you can pay the total amount. You can add 5€ in the basket till you will reach the service amount previously agreed with Franznap Miniatures after that you can pay the total amount. You can add 10€ in the basket till you will reach the service amount previously agreed with Franznap Miniatures after that you can pay the total amount. You can add 50€ in the basket till you will reach the service amount previously agreed with Franznap Miniatures after that you can pay the total amount.